Sanford residents Joe and Shelley DeRocco are in the business of building custom homes–for cats! Joe used to custom build million dollar homes for people, so when he decided to build a custom tree house for his cat, it was only a matter of tweaking the scale. 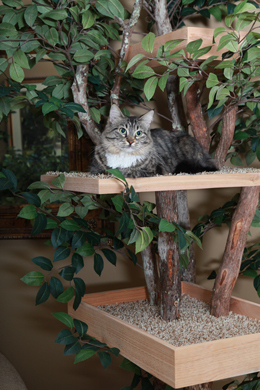 In 2008, the DeRoccos won $500 at an international business expo, which gave them the necessary investment to begin their custom cat tree house company. The DeRoccos are serious about their craft; each tree is hand-picked and each home is hand-crafted. This dedication has allowed the company has continued to grow, and last year they made $500,000 in revenue and cater to customers all over the world. But the DeRoccos aren’t in it for the money. The company, Pet Tree Houses, also donates homes to charity. Some beneficiaries include Seminole County Society for the Prevention of Cruelty to Animals, Orange County Society for the Prevention of Cruelty to Animals, Candy’s Cats, Hollywood Houndz, Pet Rescue By Judy. The Central Florida construction is booming for both humans and our feline friends! If you have any construction equipment needs, please contact Walker Miller Equipment at (407) 299-2620.